Research methods are split broadly into quantitative and qualitative methods. Which you choose will depend on your research questions, your underlying philosophy of research, and your preferences and skills. 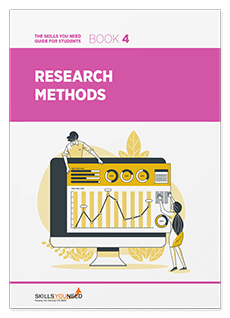 Our pages Introduction to Research Methods and Designing Research set out some of the issues about the underlying philosophy. This page provides an introduction to the broad principles of qualitative and quantitative research methods, and the advantages and disadvantages of each in particular situations. Qualitative research seeks to answer questions about why and how people behave in the way that they do. It provides in-depth information about human behaviour. Quantitative research is perhaps the simpler to define and identify. The data produced are always numerical, and they are analysed using mathematical and statistical methods. If there are no numbers involved, then it’s not quantitative research. Some phenomena obviously lend themselves to quantitative analysis because they are already available as numbers. Examples include changes in achievement at various stages of education, or the increase in number of senior managers holding management degrees. However, even phenomena that are not obviously numerical in nature can be examined using quantitative methods. If you wish to carry out statistical analysis of the opinions of a group of people about a particular issue or element of their lives, you can ask them to express their relative agreement with statements and answer on a five- or seven-point scale, where 1 is strongly disagree, 2 is disagree, 3 is neutral, 4 is agree and 5 is strongly agree (the seven-point scale also has slightly agree/disagree). Such scales are called Likert scales, and enable statements of opinion to be directly translated into numerical data. The development of Likert scales and similar techniques mean that most phenomena can be studied using quantitative techniques. This is particularly useful if you are in an environment where numbers are highly valued and numerical data is considered the ‘gold standard’. However, it is important to note that quantitative methods are not necessarily the most suitable methods for investigation. They are unlikely to be very helpful when you want to understand the detailed reasons for particular behaviour in depth. It is also possible that assigning numbers to fairly abstract constructs such as personal opinions risks making them spuriously precise. Secondary data, such as company accounts. Our pages on Survey Design and Observational Research provide more information about these techniques. There are a wide range of statistical techniques available to analyse quantitative data, from simple graphs to show the data through tests of correlations between two or more items, to statistical significance. Other techniques include cluster analysis, useful for identifying relationships between groups of subjects where there is no obvious hypothesis, and hypothesis testing, to identify whether there are genuine differences between groups. Our page Statistical Analysis provides more information about some of the simpler statistical techniques. Qualitative research is any which does not involve numbers or numerical data. It often involves words or language, but may also use pictures or photographs and observations. Almost any phenomenon can be examined in a qualitative way, and it is often the preferred method of investigation in the UK and the rest of Europe; US studies tend to use quantitative methods, although this distinction is by no means absolute. Qualitative analysis results in rich data that gives an in-depth picture and it is particularly useful for exploring how and why things have happened. If respondents do not see a value for them in the research, they may provide inaccurate or false information. They may also say what they think the researcher wishes to hear. Qualitative researchers therefore need to take the time to build relationships with their research subjects and always be aware of this potential. Although ethics are an issue for any type of research, there may be particular difficulties with qualitative research because the researcher may be party to confidential information. It is important always to bear in mind that you must do no harm to your research subjects. It is generally harder for qualitative researchers to remain apart from their work. By the nature of their study, they are involved with people. It is therefore helpful to develop habits of reflecting on your part in the work and how this may affect the research. See our page on Reflective Practice for more. Observations, which may be on site, or under ‘laboratory conditions’, for example, where participants are asked to role-play a situation to show what they might do. Our pages on Interviews for Research, Focus Groups and Observational Research provide more information about these techniques. Because qualitative data are drawn from a wide variety of sources, they can be radically different in scope. There are, therefore, a wide variety of methods for analysing them, many of which involve structuring and coding the data into groups and themes. There are also a variety of computer packages to support qualitative data analysis. The best way to work out which ones are right for your research is to discuss it with academic colleagues and your supervisor. Our page Analysing Qualitative Data provides more information about some of the most common methods. Finally, it is important to say that there is no right and wrong answer to which methods you choose. Sometimes you may wish to use one single method, whether quantitative or qualitative, and sometimes you may want to use several, whether all one type or a mixture. It is your research and only you can decide which methods will suit both your research questions and your skills, even though you may wish to seek advice from others.